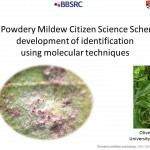 After months of collecting and analysing, the results of the 2015 Powdery Mildew Survey are in! See the complete species list here and a small commentary relating these results to the UK powdery mildew baseline here. Following success at the PM summer school in August, next week sees the start (and finish) of the 4th international PM workshop at the Jordell Laboratory, Royal Botanic Gardens, Kew.